Established in 1946, Ash Rare Books have been leading dealers in first editions and other antiquarian, rare and fine books for over sixty years, also stocking a large array of antique maps and antique prints. The firm has been owned and run since 1971 by Laurence Worms. A brief pictorial history of the firm is given on the following link. By 2003 the internet had become much the largest part of our business and we have now moved out of our premises in the City of London – working instead from a private address close by Tooting Common in South London. Visitors are still very welcome – but by appointment only. 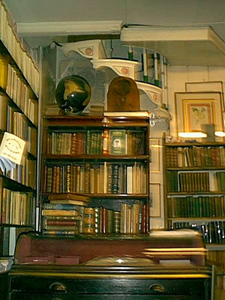 All transactions are governed and guaranteed by the Code of Good Practice of the Antiquarian Booksellers’ Association. If you are not sure about some of the words we use in our descriptions of the books you may find our guide to Bookselling Terms a help.